2 years without a video and then 2 in 2 months, I know! I seem to be on a roll, so if there’s anything you’d like to see in a video, tutorial or otherwise, feel free to let me know in the comments! 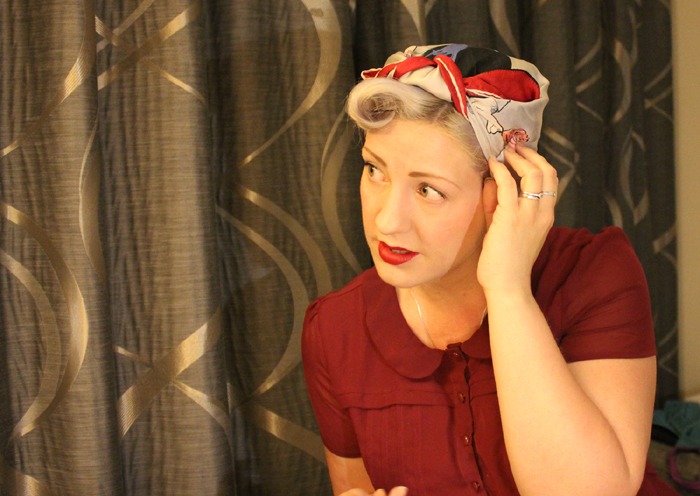 This video is on how to tie a headscarf, 1940s, Land Girl or Rosie the Riveter style. This sort of scarf is brilliant for covering up pin curls, sleeping in to keep them in place or just keeping your hair out of the way and free of dust and dirt. Cotton scarves can be easier to do this with as they are less slippery, but silk adds a bit of glamour (and I only had a silk scarf to hand) I use a medium sized scarf for this, which measures approximately 29″ along a side. If you have short hair or have flat pin curls in then you might be able to get away with using a slightly smaller scarf. A couple of years ago I wrote a post on 5 ways to tie a headscarf, and this is one of the most popular ways to tie it, but it’s far easier to show how to do it properly on a video that it is to describe in words, so here we go! I’ll be submitting this tutorial to this weeks IFB project, as it seems timely that topic came up! Hopefully there’ll be some other great tutorials in there! One of my favorite looks!!! Thank you, I enjoyed that! Considering how often I wear headscarves – I have NEVER done that with the front triangle before. What is WRONG with me?? ha ha! I usually fold that bit over and pin it and *then* tie and tuck in at the sides. I shall be trying this as of tomorrow! that hair style is so pretty on you!